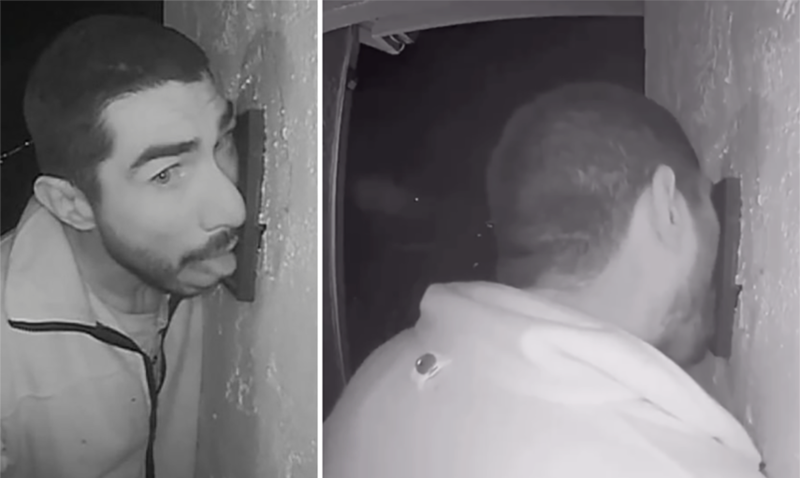 It’s one of those stories that we laugh and brush off as nothing more than a joke, but authorities reveal that this one is 100% true – a man in California was caught on camera licking a stranger’s doorbell for 3 hours straight. If you think that this sounds too crazy to be true, you’ve gotta hear the details of this one! Sylvia Dungan and her husband were out of town when they noticed that the home security camera was sending many notifications to her phone. While their children were home, she couldn’t help but notice the timing. Her son was expected to get home early in the morning, but the camera was being triggered for hours prior to that. What she discovered was shocking, to say the least. A complete stranger had come onto her property in the wee hours of the morning and started to lick her doorbell. Even more confusing, he didn’t just lick her doorbell once or twice like he had been dared by friends (a likely explanation, right?). He proceeded to lick her doorbell off and on for 3 hours, taking a break only to relieve himself in the couple’s yard and to steal an extension cord from their Christmas lights display. Luckily for authorities, the security camera the Dungans installed was able to record video so clear that they could identify the man in question – 33-year-old Roberto Daniel Arroyo. In fact, it didn’t take them long to identify Arroyo who is known to local law enforcement, having a history of misdemeanor offense including being under the influence of narcotics, public intoxication and resisting arrest. Authorities are still looking for Arroyo who may face three misdemeanor charges as a result of his actions that night – petty theft, prowling, and violation of probation. Whether charges will be pressed will be up to the Monterey County District Attorney’s Office after they review the case.